Since mid-2006, the S&P CoreLogic Case-Shiller U.S. National Home Price Index first tumbled 27.4% and then bounced back 53.6%, for a cumulative 12-plus year gain of 11.5%, equal to 0.9% a year. Could we be facing another dip? According to the National Association of Realtors, home sales fell 10% over the past year, in part because of rising mortgage rates. That’s worrisome: Slowing home sales often precede a fall in house prices. 1. Homeownership isn’t as safe as it feels. A house is a big, leveraged, undiversified bet—arguably riskier than owning a diversified stock portfolio. Yet it doesn’t feel that way. Why not? Partly, it’s familiarity. We look around our house and see the value that’s there. And partly, it’s a money illusion. If we got daily updates on our home’s value, like we do on our stock portfolio, we wouldn’t be nearly so sanguine about our huge real estate wager. 2. We shouldn’t buy unless we can see staying put for at least five years—and preferably seven years or longer. Buying and especially selling real estate involves steep transaction costs, and we need many years of price appreciation to overcome that hit. 3. Over the long haul, home prices nationwide should rise roughly in line with per-capita GDP. Why per-capita GDP? That’s a gauge of our ability to pay. Sure enough, over the past 40 years, per-capita GDP has climbed 4.5% a year—and home prices are up 4.3%, according to Freddie Mac. Meanwhile, inflation clocked 3.4% annually. 4. The land underneath our homes should appreciate, but the dwelling itself will depreciate—and we’ll need to fork over hefty sums just to keep up with the general increase in home prices. As a rule of thumb, expect to spend a sum equal to between 1% and 2% of a home’s value on maintenance each year. 5. Any gain in our home’s value will likely be largely or entirely offset by transaction costs, maintenance, property taxes and homeowner’s insurance. Subtract those costs from our home’s annual price gain, and we probably aren’t keeping up with inflation and there’s a good chance we’re losing money. 6. The benefits of leverage are often offset by the cost of leverage. Homeowners may put down just 10% or 20% of a home’s purchase price—but they collect 100% of any price appreciation. Result: Even prosaic property price increases can be transformed into wondrous gains—or so it seems. 7. The mortgage-interest tax deduction has always been overrated—and, today, that’s truer than ever. If we pay $1 in mortgage and we’re in the 22% tax bracket, we only save 22 cents in taxes, which means the other 78 cents is coming out of our pocket. 8. If you’re a homeowner with a fixed-rate mortgage, what you really want is inflation. Why? That inflation will likely drive up both your home’s price and your salary, while leaving your mortgage payment unchanged. That means you can repay the mortgage company with depreciated dollars, while having more disposable income for everything else. 9. While a home’s price appreciation and mortgage-interest tax deduction will likely prove disappointing, homeowners enjoy one huge benefit: They get to live in the place. How much is this imputed rent worth? Think about how much you’d collect each year if you rented out your house. 10. All homes should be priced to deliver the same expected total return. Folks will talk about real estate in, say, San Francisco and Silicon Valley, as though these are magical markets that somehow defy economic norms. 11. A paid-off home is the cornerstone of a comfortable retirement, for two reasons. First, by paying off our mortgage, we eliminate a major expense, making retirement more affordable. Second, thanks to the forced savings that come with paying down a mortgage’s princ ipal balance, we eventually come to own a major asset free and clear. That asset can then help us to finance our retirement, either by trading down to a smaller place or taking out a reverse mortgage. 12. Remodeling is a money loser. If we undertake home improvements, we’ll increase the value of our home—but by less than the dollars we spend. For proof, check out Remodeling magazine’s annual cost vs. value survey. It analyzes 22 home improvement projects. Depending on the project, if we sold soon after making these home improvements, we might recoup as little as 50% of the money spent. 13. A real estate agent’s greatest financial incentive isn’t to get us the best price, but to get us to act quickly. If we spend an extra month looking for the right home—or holding out for a higher price—the agent might make little or no additional commission, but he or she will have to put in substantially more work. In January, HumbleDollar had its best month ever for web traffic. What were folks reading? Check out the seven most popular blog posts. Read how Jiab Wasserman and her husband paid off their mortgage in 13 years—setting themselves up for early retirement. Experts and parents worry about the impact of video games on children’s mental health. Jim Wasserman asks: Do these games also promote bad financial habits? Want to buy happiness? Ross Menke’s five strategies: Help others, don’t let special treats become routine, favor experiences over possessions, hire others to do chores you hate, and pay now but consume later. Got a stock or bond that’s worthless? Be sure to claim the tax loss in the first year the security could be considered entirely worthless—or the deduction may not be allowed, warns Julian Block. Follow Jonathan on Twitter @ClementsMoney and on Facebook. His recent articles include Price Still Slight and Choosing Our Future. 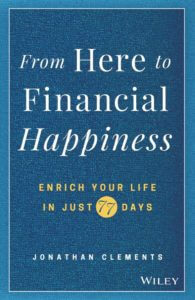 Jonathan’s latest book: From Here to Financial Happiness.